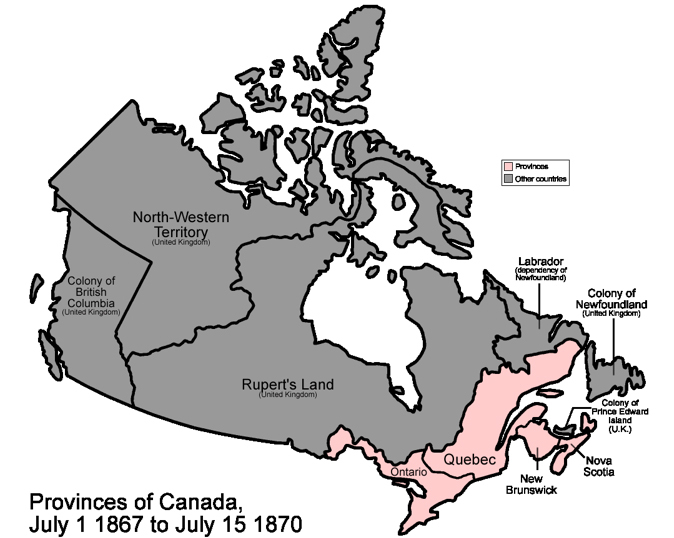 The Federation of Canada was born in 1867 when the four colonies of Lower Canada (Quebec), Upper Canada (Ontario), Nova Scotia and New Brunswick were joined by the British North America Act. They would later be joined by other colonies and territories. The reasons for their coming together is somewhat complex but basically revolved around the complex balance between the English and French speaking spheres with the added complication of American designs. The English and French speaking areas had been forced to join together in 1840 thanks to the Durham report. This itself was in response to an 1837 rebellion in the Upper and Lower Canadas. Lord Durham stated: "I found two nations warring in the bosom of a single state: I found a struggle, not of principles, but of races..." He recommended that the two provinces be reunited into a single Province of Canada. Although the principle was based in compromise, both groups felt uneasy with this enforced marriage. It did not help matters when Canada moved into something of an economic slump in the 1840s. This was as a result of the Repeal of the Corn laws in Britain. Canada no longer had privileged access to the British market. At one fell swoop, Canada's largest industry faced disaster. East and West Canada conspired to create their own Federation so that they could re-establish their respective differences in their own Provinces. Invitations were sent out to the other Atlantic Maritime colonies to see if they were willing to join in the Union as well. Nova Scotia and New Brunswick quickly took the opportunity to join the negotiations. These two colonies were particularly motivated by defensive considerations. The Americans had only just demonstrated their growing military power by the American Civil War. This military build up even spilled over into New Brunswick if only in a non-official capacity. Fenians serving in the Union Army invaded New Brunswick hoping to stir the Irish and Scots into rebellion. It was quickly defeated but demonstrated the need for vigilance on the American border. Newfoundland and Prince Edward Island, both being islands, did not feel the same imperatives to join the Federation out of fear of the United States. Newfoundland would actually remain a Dominion colony until 1949! Prince Edward Island even considered applying to join the United States - although this was partly a negotiating tactic to get better terms on entering the Canadian Federation. They joined in 1873 after extracting a promise from the Federation to fund a railroad and to buy out absentee landlords. An 1818 agreement with the United States had extended the principle of the Canadian border flowing along the 49th parallel to the Rockies. Of course, there was little European population in those lands to make these claims a reality. However, there were some Europeans operating in the area. The Hudson's Bay Company had the hunting and trapping rights for most of the rest of the continent North of this parallel and excluding Alaska. They employed an odd collection of hunters and trappers from all over North America and beyond. Many of them were descendents of French colonists who had travelled West to keep away from the British, others were Metis - mixed Indian/European descendants. Many were just adventurers seeking a living from the wild frontier lifestyle. These would be joined by Scottish settlers leaving Scotland thanks to the Highland Clearances. Many of these ended up in the Red River Colony in Manitoba. This had been bought by Lord Selkirk in 1812 from the Hudson's Bay Company. The industrious Scots made the most of the Plains of Manitoba and managed to build a reasonable community for themselves. 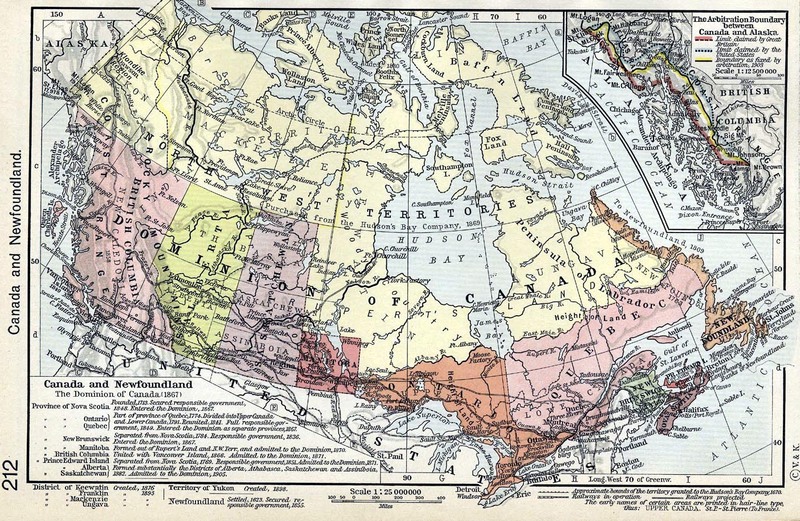 The Metis and the Scots settlers were to find themselves unlikely allies in 1869 when the Hudson's Bay Company sold their rights to the new Canadian Federation. An army of surveyors descended on the Plains with a view to speculating and carving out new communities. The Metis and some of the Scots rose up in what was called the Riel Rebellion. Scottish Protestants tried to resist this rebellion and a Thomas Scott was captured and executed by Louis Riel for his troubles. This itself caused outrage back in Ontario and an army was quickly despatched to put down the rebels. Riel escaped over the border to the United States. Although he attempted to return with a second rebellion some fifteen years later. This time he was captured and he was executed in 1885. Meanwhile, Manitoba was hurriedly entered into the Canadian Federation in 1870. Settlers were not just moving in a westwards direction. The island of Vancouver had long been a trading post of the Hudson's Bay Company. However in the 1840s, there was a real scare of invasion from the United States over what was called the 'Oregon Question'. 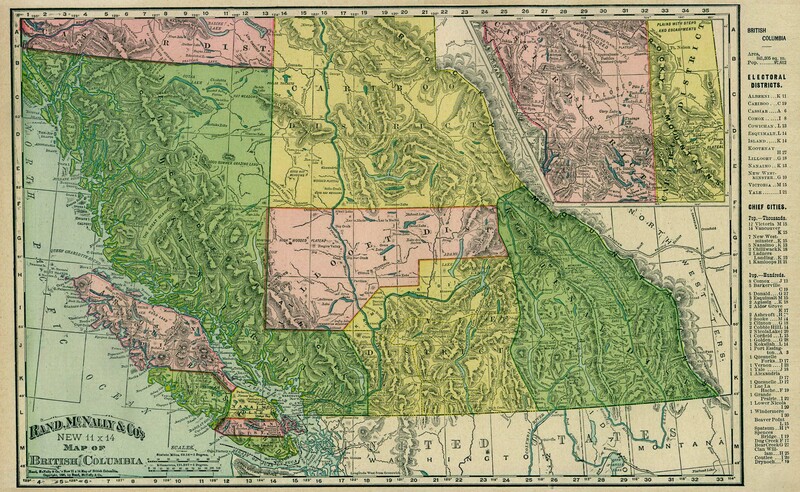 Inconveniently, the 1818 agreement had only fixed the border along the 49th parallel up to the Rocky Mountains. This mean that the area West of the Rockies was in dispute. The Americans were claiming that Oregon extended all the way up to 54.40 parallel. 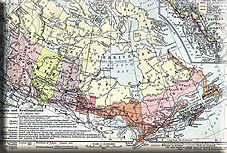 The two sides only came to an agreement in 1846 with the two sides agreeing to extend the 49th parallel agreement. Although inconveniently the island of Vancouver extended south of that line which led to more diplomatic difficulties before the Americans yielded it to British Columbia. It was helped by the fact that the British had one of their major military forts on the island at Victoria. British Columbia got an unexpected boost to its population in the 1850s when gold was discovered along the Fraser River. People flocked from all over the world. Most would disappear again when the seams ran dry, but not all of them. Besides, coal was discovered in large quantities on Vancouver Island making for a more lasting economic activity. In fact, these coal seams would allow the Royal Navy to repositions its American Pacific Squadron from Valparaiso in Chile to Vancouver. In 1871, British Columbia agreed to join the Canadian Federation in return for the promise to fund a trans-continental railway. This engineering feat in turn would allow the provinces of Saskatchewan and Alberta to fill with settlers and get their produce to worldwide markets. The last piece of the Canadian jigsaw was Newfoundland and Labrador. Newfoundland had stayed stubbornly independent from the rest of the Canadian mainland. It felt that its prime industry of fishing had little in common with the agricultural priorities of the Great Plains. However, the 1930s saw the worldwide depression and Newfoundland was particularly hard hit. In fact, it went bankrupt and British Commissioners had to be sent to the island to administer its finances from their Hotel rooms in St John's. World War Two further demonstrated the the colony's dire financial situation in being unable to afford appropriate defences. America stepped in to help defend the colony. In 1949, the colony finally bit the bullet and applied to join the Canadian Federation although only be a wafer thin 50.5 v 49.5 percent majority. This is a full reproduction of Beatrice Young's book written back in 1911.